Print multiple Visio files in batch mode without the need to open and print each one separately. For Visio 2007 and 2010 32-bit versions. Try it FREE for 10 days... click Download Sample. "VisiBatchPrint is fantastic! This tool saves us tremendous time each month as we build our work packets. We print over 3000 Visio documents per month. The product was already a huge time saver, and the new features are really going to improve our productivity. 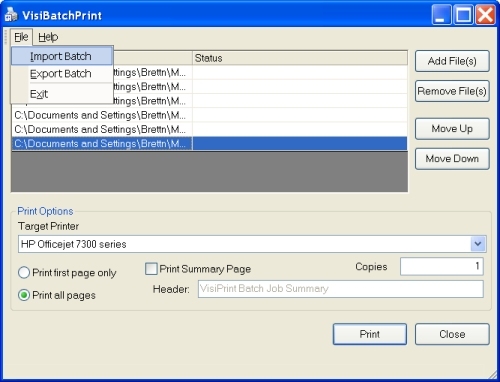 Batch printing multiple page files will save us days by itself. Thanks!" 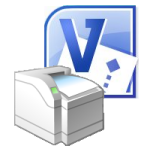 Chris Bailey - GMR Protection Resources, Inc.
VisiBatchPrint™ is a “batch” printing utility that allows the user to select a set of drawing files to be printed by Microsoft® Visio®, without manually opening each of these files inside Visio first.